The top Bollywood Actors are a talented crew of individuals who enliven the lives of Indian moviegoers. Everyone in Bollywood knows their names and more than likely you’ve seen at least one movie with them in it!! Aamir Khan began acting when he was a very young child, and eventually made it big in 1988 with the movie Qayamat Se Qayamat Tak. He is considered the “Tom Hanks” of Bollywood! Here’s a piece of trivia about the actor: Time magazine called him the Sean Penn of Bollywood! Shahrukh Khan is known as “The King of Bollywood”, “The King of Romance” and “The Baadshah of Bollywood”. Khan rose to fame in the television tv show Dil Dariya. An interesting fact about the actor: his first name means “Face of the King”. Salman Khan has starred in over 6 dozen films and remains one of Bollywood’s top actors. His first role was in the 1988 film Biwi Ho To Aisi, and since then he has starred in numerous films, most recently including the movie Ready, a mega-hit in 2011. Fun fact! Khan’s favorite actor is Sylvester Stalone! Ajay Devgan is an Indian actor who started his career with the hit movie Phool Aur Kaante. He has won numerous awards for his roles including Best Male Newcomer for his role in Phool Aur Kaante. Devgan trivia: he dated Karisma Kapoor before he got married! Bollywood actor Akshay Kumar’s real name is Rajiv Hari Om Bhatia. This famous Bollywood star not only acts, but also does many of his own stunts while acting! He made his debut in the film Saugandh. Something of interest about this actor – he’s a martial artist! Actor Hrithik Roshan was born in Mumbai, became a child actor, and then went on to become a sensational hit in films. His first film was Kaho Naa… Pyaar Hai. Did you know that Roshan used to stammer? News Aamir Khan, ajay devgan, akshay kumar, hrithik roshan, Salman Khan, Shahrukh Khan. permalink. ‘Dhobi Ghat’ makes it official – Aamir Khan is different! ← Actor Amitabh Bachchan carries Olympic Flame! Let’s watch some Films Bollywood! 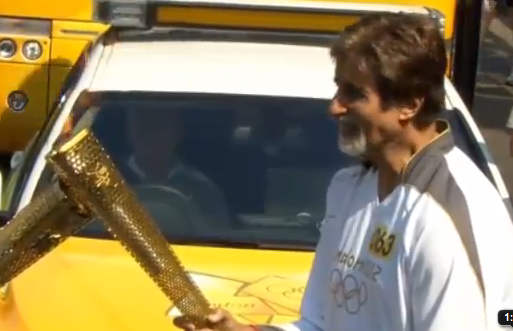 Actor Amitabh Bachchan carries Olympic Flame!